For children between the ages of four and seven, going on holiday is a big adventure – and planning it should be just as exciting for the parents! Choosing a holiday that will keep the adults relaxed and the children entertained can be a difficult task; but here, we’ve outlined some of the best places to go and things to think about when planning a holiday with school-age children in tow! School holidays: once the children are of school age, you’ll have to plan family holidays around when the schools are off – but never fear! With six weeks during the summer, two weeks at Easter, the Christmas holidays and three half-terms each year, it’s easy to find time when the whole family is free. During the summer, some destinations may be at their hottest during the months of July and August, so check the destination temperatures before you book – and remember, schools are often off until the first week of September too. Flying: children can be either very excited by the prospect of flying, or can get quite scared. It’s important to explain to children that flying is safe and fun, especially if they will be taking a long-haul flight. To reassure them, talk to them about flying before the holiday, and if possible, watch planes taking off and landing whilst you’re at the airport. Between the ages of 4 and 7, children can really enjoy kids’ clubs provided by the hotel – so check what is available when you’re planning your trip. Kids’ clubs can vary in the activities they offer – from camel rides and Arabic lessons in Dubai, to Kids Cooking in Orlando, so investigate the kids’ club before you book! Some hotels will require that you stay on the premises whilst your child is in a kids’ club – which makes perfect timing for a relaxing spa visit! Do be aware that young children are likely to get tired more quickly than usual on holiday, particularly in hot weather, or when they have to do a lot of walking around the hotel or attractions. Many European destinations eat their evening meal a lot later than in the UK too, so you may find that little ones end up snoring into their dinner! Establish whether there will be a lot of walking in the area you’re visiting, and whether there are early dinner sittings available. - Sydney is a great place to take school aged kids for a holiday; the Australian summer is during the UK winter, so it makes winter sun a great choice for the Christmas holidays! There’s plenty for outdoors-loving kids to enjoy, from water-sports and beach excursions to exploring cultural sites like the Sydney Opera House and the iconic Sydney Harbour Bridge. Kids will also love meeting Australian wildlife at Taronga Zoo, in central Sydney. - Another option is taking the kids to New York; a particularly good choice if you have any budding fashionistas within the family! As well as the many designer stores, there’s also FAO Schwarz – the world’s largest toy shop – which includes a range of ‘there-to-be-played-with’ toys on the shop floor! For children who love to be dazzled by glitz and glamour, there’s also a range of shows available to see on Broadway, and there’s history to be experienced at the American Museum of Natural History. 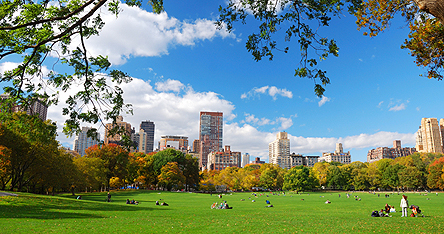 New York offers a great experience for kids and adults alike. - Perhaps surprisingly, Hong Kong is another great destination for a family holiday. With a combination of contemporary architecture and pockets of tranquillity, Hong Kong is a great place to introduce children to a different culture. The buzzing markets, stunning views and occasional jewel green parks will all excite children – and if it all gets too much, there’s always Disneyland Resort, Hong Kong!